He succeeded his renowned teacher, William Kincaid, as solo flutist of the Philadelphia Orchestra. He has held the position of principal flute also with the symphony orchestras of Detroit and Indianapolis. His performances have included those under such eminent conductors as Leonard Bernstein, Pablo Casals, Neville Mariner, Eugene Ormandy, Leopold Stokowski and Igor Stravinsky. 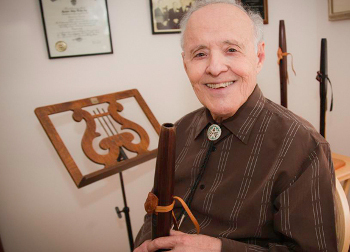 For many years he served as Professor of Flute at Indiana University, and many of his students now hold prominent university and symphony positions. During much of his career as a classical flutist and artist teacher he has appeared throughout the U.S., Canada, Mexico and abroad. For more information on Mr. Pellerite, his publications and recordings, please visit www.jamespellerite.com.